Guptipara is the home of Bengal’s first community Durga puja, the place where first branded Bengali sweets graduated from makha sandesh (sandesh mixture) to gupo sandesh (a variety of sandesh pieces), and the birth place of legendary folk singer Bhola Moira amid terracotta temples. It is located around 75 km from Kolkata on the Bandel-Katwa railway line. The train was quite empty. The Katwa local takes about 2 hours 10 minutes to reach Guptipara. Then we hired a van rickshaw (instead of cycle rickshaw from the station) for Rs 120. It was settled that he will show us the terracota temples, place where first community Durga Puja took place, river bank. While going towards the main temple complex , we saw one small temple, an old old zamindar (Mr. Sen) house and a garden house of them. The town is quite neat and clean , unlike what you associate with a normal town which are near Kolkata. We also saw the famous Charriot /Rath of Jagannath and Subhdra just beside the temple complex. The main main temple complex houses 4 Vaishnava temples — Chaitanya, Brindabanchandra, Ramchandra and Krishnachandra — which offer an interesting mix of Bengal’s temple architecture. The temples were constructed in different periods. The Chaitanya temple, built by Bishwar Roy in the mid-16th century, is the oldest. The temple consists of 2 thatched hut-shaped structures. The structure was adorned with some of Bengal’s earliest terracotta carvings, but they didn’t survive the march of time. The 60-feet high Brindabanchandra temple, built in 1810, dominates the temple complex. The aatchala temple doesn’t have terracotta(burnt clay) work but that is compensated by the colourful paintings on both the outer and inner walls. The Brindabanchandra temple is flanked on the left by the Ramchandra temple and on the left by the Krishnachandra temple. The ekratna (single pinnacled) Ramchandra Temple was constructed in late 18th century by Harishchandra Roy, the king of Seoraphuli. It may be called the most elegant temple in the complex. The single-storey temple with an octagonal turret contains rich terracotta work on the walls and the turret. The carvings depict war scenes from theRamayana, royal processions, voyages and glimpses of everyday life. The Krishnachandra temple was constructed in 1745 during the rule of Nawab Ali Vardi Khan and is also in the aatchala form. All the temples stand on elevated platforms and are interconnected by narrow, arched passageways. 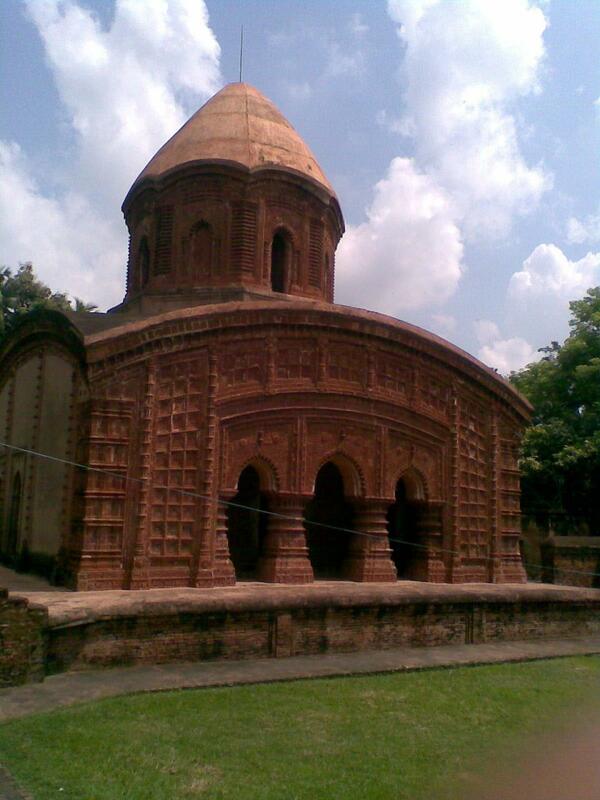 The heritage of Guptipara is not restricted to its temples alone. The place was a stronghold of Vaishnava culture. Even today, residents observe Rash, Dol and Rath festivals with great enthusiasm. 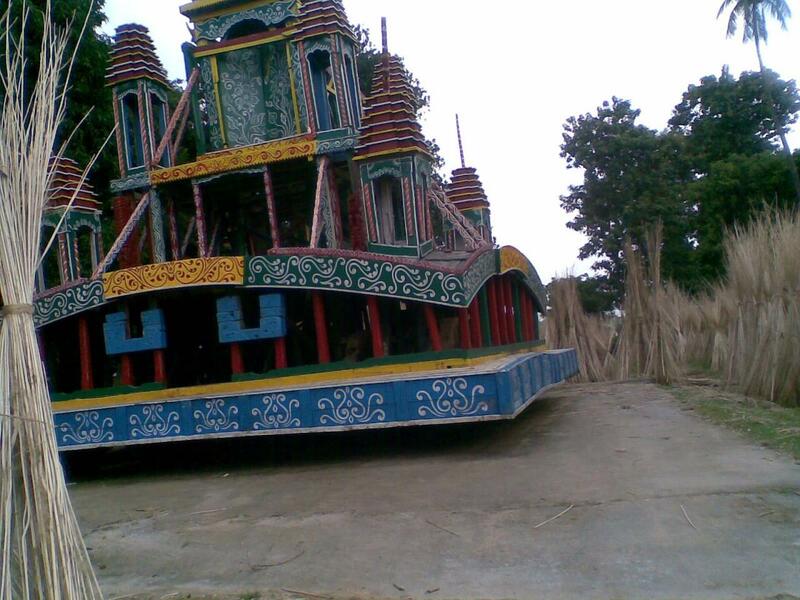 Rath Yatra is Guptipara’s biggest festival. The Guptipara rath, one of the tallest in Bengal, covers the longest distance after the Puri rath. A day before Ultarath, a festival called Bhandar-loot is held here. Bengal’s first community (Jagadhatri) puja was organised in Guptipara when some men were stopped from taking part in a household Durga puja. Twelve(12) of them formed a committee and organised a barowari (baro means 12) puja. There is, however, some debate about the year the puja was started. While coming back from the temples, we went to the garden house and then saw the Sen's(Zamindar) Puja. (We also saw the place/temple where first community/Barwari puja started, which is near that place) .The puja we saw there is quite interesting. We suddenly saw number of Honda City cars parked outside the place. It is quite unusual site, in a place like this. We chatted with that family and had some prasad (including gupo sandesh.Guptipara is a great place for those with a sweet tooth. The place is famous for gupo sandesh, considered by many as Bangal’s first branded sweet). We got to know that the family is origianally from Bangaldesh. Since the family has become quite big, the responsibilty of the puja is bestowed on the families in a revolving manner. In other words same family does the puja every fourth year . For other years it is the responsibily of other group of the same family. The family is no doubt, quite prosperous. Guptipara is also the birthplace of kabiyal (folk singer) Bholanath Nayak, popularly known as Bhola Moira, who was defeated by the legendary Antony Firingi in a musical duel.But there is hardly any trace remains of Bhola Moira’s birthplace. Then we went to the ghat/river bank. We hired a boat for Rs 30 (it is basically a fisherman's boat) and he showed us his day's catch while boating. We returned after a boat ride of 20-25 minutes in Hoogly river. Then we went back to the station. We skipped our lunch, since the prasad we had at the puja pandal was enough for us. From the station we took a train which goes upto Bandel in an hour. From Bandel we took another train to Naihati and from Naihati we are back to Sealdah. My grandparents owned a bagaanbari in Guptipara and we spent our summers there. It was sold when I was in high school. I miss those days. I found your blog while searching for the temples. Very nice thank you. Will do the trip this time when we visit kol. Guptipara is also famous for its Taant Saris, nearly every house had a charkha and many had sari making looms. The mangoes were phenomenal.